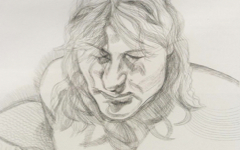 Michael Kimmelman, the New York Times critic who knew Lucian Freud, wrote in his elegant hommage to him in today’s paper that he hated small talk, kept to himself and thereby maintained an air of mystery about his work. 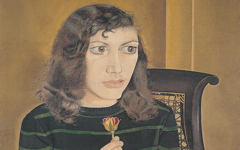 I have revealed some of Freud's visual illusions before, like the self-portrait hidden in the model’s hair in his early 1947 Girl with Roses (left). Now, two days after his death, here is another. The artist wrote to Buckingham Palace asking H.M. Queen Elizabeth II to attend numerous modeling sessions, a request which she, most unusually, acceeded to. Little did she know, of course, what she was getting: an A4-size portrait of Lucian himself fused with her features. He gave it to her so it now hangs in St. George’s Chapel, Windsor. 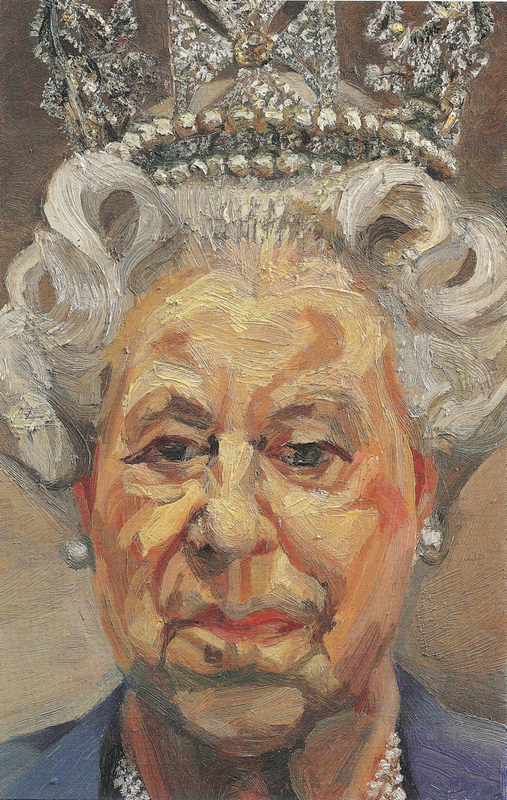 Freud, Queen Elizabeth II (2001) Oil on canvas. Royal Collection, Windsor. As also explained in Part 1, Lucian used the shape of the diamond-studded cross on the Imperial crown to style his own hair in an independent self-portrait: Lucian with a soaring, silver cross. 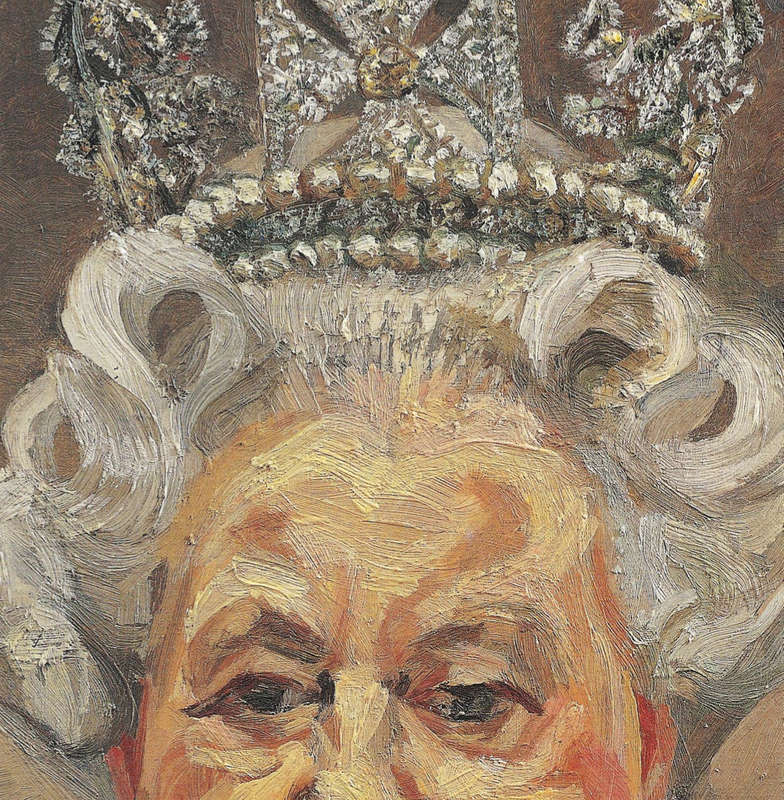 He also, in this same portrait of the Queen, formed H.M.'s silver hair into his own abstracted profile. 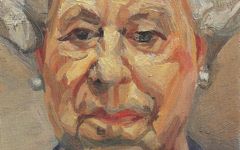 It is not a portrait of the Queen, as she no doubt presumed, but of him as the Queen in his mind. Take a look. 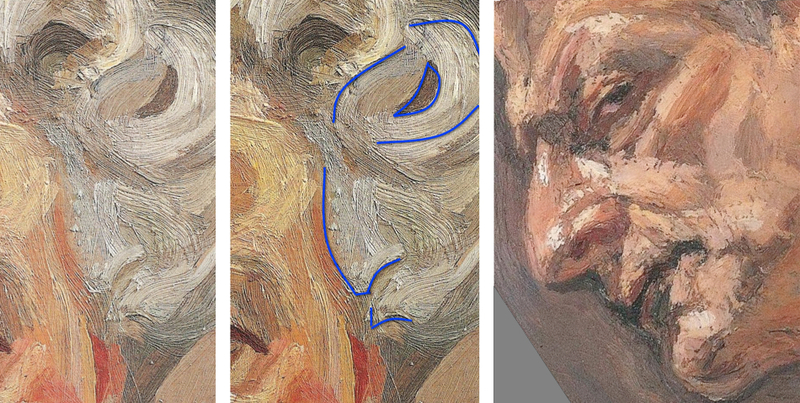 The detail of hair is at left, a diagram of his hidden profile in the center, and his profile as depicted in an independent self-portrait at right for comparison. Take time to study the comparison, then click the next thumbnail and you will be able to see it afresh in the whole portrait. The other coils of hair resemble eyes looking out at us. They may or may not reflect the inner eye of his mind. 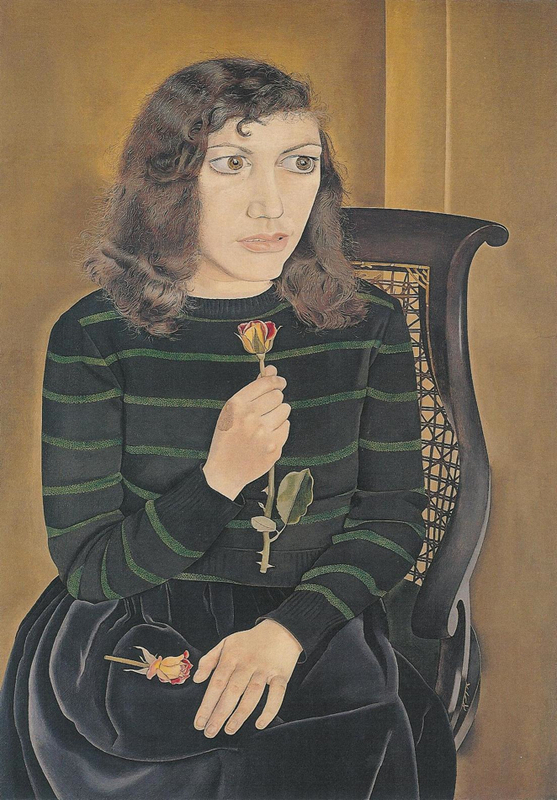 Once, though, the portrait is put in its correct poetic context, all manner of new perceptions become possible, helping you on your own to increase your aesthetic satisfaction of what before was simply a portrait and a very poor likeness at that. In the coming days I will publish more illusions by Freud. Each new one reduces the possibility that I am hallucinating and confirms the likelihood that we are looking at the image as Freud painted it, with mystery. Read Part 1 of the entry on this painting. Original Publication Date on EPPH: 23 Jul 2011. © Simon Abrahams. Articles on this site are the copyright of Simon Abrahams. To use copyrighted material in print or other media for purposes beyond 'fair use', you must obtain permission from the copyright owner. Websites may link to this page without permission (please do) but may not reproduce the material on their own site without crediting Simon Abrahams and EPPH.